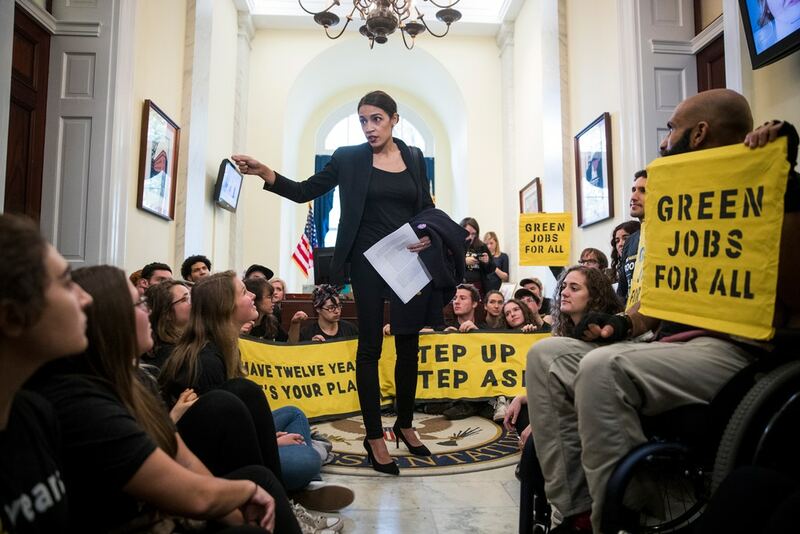 Rep. Alexandria Ocasio-Cortez, newly minted New York Democrat, is touting a “Green New Deal,” that would eliminate nearly all fossil fuels by 2030, jack up marginal tax rates to 70 percent, and guarantee a basic income. The plan enjoys support from at least 40 members of the House and some likely presidential candidates, but as it turns out, not much about this deal is new. Justin Haskins of Fox News finds similarities with the “Leap Manifesto” touted by an axis of socialists and environmentalists in Canada. These include Naomi Klein, author of This Changes Everything: Capitalism Versus Climate, The Shock Factor: The Rise of Disaster Capitalism and other books. Klein is also a contributing editor at The Nation, where she wrote in 2011 that “arriving at these new systems is going to require shredding the free-market ideology that has dominated the global economy for more than three decades.” In 2014 she told the New Statesman, “I do view free-market ideology as essentially a cover story for greed. I don’t think it’s an ideology that should be taken entirely seriously.” And so on, but there’s a problem here. Free and uncoerced exchange among individuals is not an ideology. The notion that a wise elite can plan a society for the greater good of all, with little if any downside, is indeed an ideology. As F.A. Hayek showed in The Road to Serfdom, knowledge about allocation of resources is dispersed among many people, and no individual or group of experts can hold a monopoly on such knowledge. This is why socialist regimes from the USSR to Cuba to Venezuela have been economic basket cases. Under socialism, Hayek explains, the worst get on top and suppress public criticism and “everything which might cause doubt about the wisdom of the government or create discontent will be kept from the people.” As Haskins notes, “Leap Manifesto” supporter David Suzuki wants the government to jail those who deny global warming. In similar style, Sen. Sheldon Whitehouse (D-RI) wants to deploy RICO laws to prosecute global warming skeptics. Ideology involves the presumption of superior knowledge, imposed and enforced by a powerful elite. Individuals acting in a free market is not an ideology and has a better record of preserving both liberty and prosperity than the ideology of socialism.